Women are given a lot of feedback about how they’re supposed to feel about their abortion. Sad. Remorseful. Traumatized. Unsafe. Penitent. The narrative is a minefield of misconceptions about what an abortion even entails. And forget trying to find helpful information on the internet (although it’s gotten a little bit better). Thanks to pop culture, the media, and the extreme religious right, women are presented with the good woman/bad woman binary, and only bad woman have abortions. Yet here we are, being fed what appears to be the common abortion story in magazines, on TV, and in movies, only to find out that representations in popular media turn out to be quite bogus when we talk to women about their abortions. The vernacular narrative doesn’t reflect the complexity of women’s experiences, and needs to be rototilled until real stories can rise to the fore. 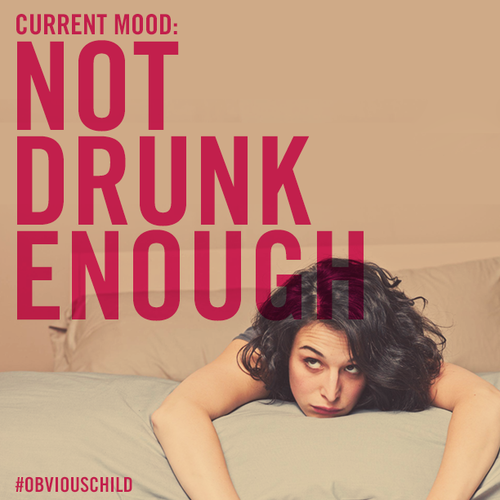 And in walks Obvious Child, a romantic comedy about abortion. It portrays a young woman who, among the many other things going on in her life besides what’s happening in her uterus, makes the decision to have an abortion. The leading lady, a snarky comedian and bookstore clerk from Brooklyn, goes through a breakup and a one-night stand all in a matter of weeks. The latter means that she gets pregnant, decides to have an abortion, and schedules it for Valentine’s Day. The best part of this film is that it underscores the fact that it’s possible to feel two opposing feelings simultaneously when faced with an unplanned and unwanted pregnancy, and those feelings may change from one minute to the next. Relieved/sad. Reassured (thanks to the fantastic staff at clinics like Planned Parenthood)/stressed (because you just lost your job and aren’t sure how you’re going to pay). An abortion is never an event in isolation, divorced from one’s relationships, bank account, emotions, professional aspirations, and family circumstances and politics. That’s the point. It’s a small piece of your whole life. But here’s the reality. 1 in 3 women will have an abortion in their lifetimes. She will survive her procedure (despite normative fictional depictions of abortion onscreen). She will experience few (if any) complications. Her procedure will take a very short amount of time, and she will move on with her life. It’s very likely that her friends have had an abortion. It’s very likely that her mom had one, but under crazier circumstances. It’s also very likely that having to pay for an abortion will be complicated for her (because low-income women do not have abortion access and our health coverage in this country is pretty enraging). And it’s also very likely that she will have an abortion and then go on to thrive. Sure, some women may feel sad or alone after their procedure. But in my experience talking to women about abortions, it’s rarely the abortion itself that’s the sole source of stress. Finding $600+ dollars in a matter of days is stressful (which is why we need abortion access funds). Pregnancy hormones are no joke, so you’re not feeling the most top notch. Sometimes your parents aren’t supportive. Sometimes you’ve experienced sexual violence. Sometimes your birth control has failed (ugh.) Sometimes your partner is terrible and doesn’t support you. The whole point is that the wide gamut of feelings is acceptable for each individual because there are ten million factors influencing how you feel. 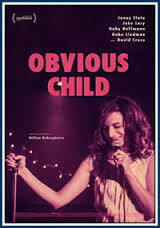 Something that should NOT be influencing how you feel is stigma, and one thing that helps to break away the stigma is finding stories like Obvious Child in the mainstream. I applaud Jenny Slate and Gillian Robespierre for their gusto, and hope that other stories like this make it into the mainstream. I applaud Emily for sharing her abortion story and NotAlone.us for creating a safe space online for women who have had abortions. And while I hope that other filmmakers and producers of pop culture follow suit, every screening of this film is a request that mass media undergo a paradigm shift. A time for films that accurately represent the genuine experiences of women who have abortions and that break the cycle of stigma and shame is long overdue. I can’t wait to see this. On top of the fresh portrayal it gives us of an abortion story, Jenny Slate is brilliantly hilarious.